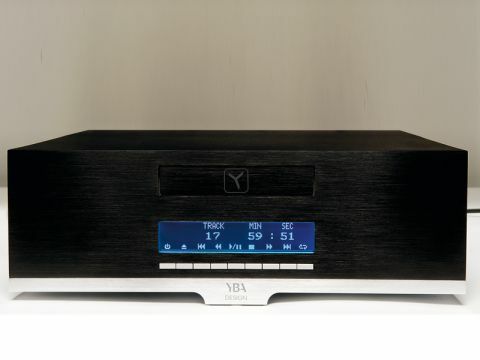 From the French designers at YBA, but made (like so many other components these days) in China, the YBA YC201 may or may not have anything definably Gallic about it, but is certainly rather natty. We're very much taken with its use of the display to indicate the function of the nine buttons on the front: unpowered, it tells you absolutely nothing, but once fired up is very easy to use. Round one to YBA. The rest of the appearance is quite impressive for the price, the case being made mostly of aluminium, neatly shaped and fitted together and angular without having the skin piercing sharp edges of one or two brands we could mention. The remote control is a definite point in YBA's favour, a solid-metal affair that feels and looks particularly impressive. The electronic design is fairly conventional. A computer CD-ROM drive is connected via its digital output to an audio board that includes a familiar digital receiver, upsampling and DAC chips, plus a typical analogue output circuit. There's a conventional linear power supply based on an R-core mains transformer, and parts are of decent quality, if nothing particularly outstanding. We're not entirely sold on the idea of CD-ROM drives, for a couple of reasons: first, they are a bit slow to load a disc and second – rather more seriously – they have a marked tendency to make a lot of mechanical noise. This player is definitely one we'd rather have a good distance from the listening seat, as it emits a slightly tuned whistle that has a way of making itself heard above surprisingly loud music. That apart, the sound has plenty going for it. One of those things, it should be made clear at the outset, is a degree of character that we anticipate not all audiophiles will care for. Some, however, will love it. One listener's comment sums it up well; "A bit lively, isn't it?". And yes, it does certainly seem to be that, in both good and bad ways. Of course, there's nothing bad about lively as such – there's nothing worse than lifeless music-making. But it's not necessarily the job of music-reproducing equipment to put the life in, merely to preserve it as recorded and just occasionally we felt this player may be a bit too much of a good thing. It sounded great in our Ian Dury track, marvellously energetic and revelling the grit and sarcasm of the singer's delivery. But with the complex sounds of the Penguin Cafe Orchestra it seemed to be on the verge of hysteria, the carefully layered music lacking some control and precision. Classical voice and piano produced generally neutral results, though the piano showed off the YBA's good bass extension and attack to advantage, but again Rachmaninov's orchestral fireworks seemed perhaps a touch on the overexcitable side. Experiments with further tracks in various musican veins confirmed that rock is a good stylistic match to the player, with quite a lot of jazz faring well too and, perhaps surprisingly, simple ballad-style stuff scoring quite a hit. That may well be more due to the player's appealingly neutral and unforced detail in the midrange, which suits voices well. High treble is a little congested and lacks some of the finesse of the best players, but as mentioned above the bass is very good, with both presence and detail in plenty. What it doesn't manage quite so well is the tuned quality of instruments like double bass and gently-played orchestral timpani, but that may be splitting hairs when the essential bass quality is so very likeable.